Your preferred vendor of custom aluminum safety constructions. Benelux leader and selling worldwide since 1968, JOMY specialises in: emergency egress for public and private buildings, industry access at heights, building access, facade access and industrial structures for interior and exterior. All products are delivered direct from the manufacturer. 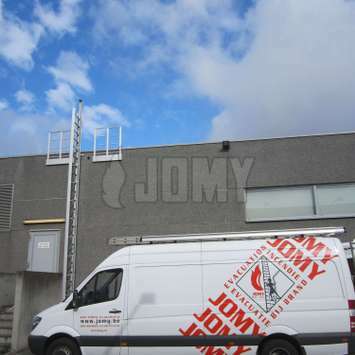 To offer you the right solution, JOMY has its own engineering, production and installation crews. Gathered through the years, JOMY's extensive experience makes it the best professional aluminium constructions engineering and manufacturing company for safety constructions. JOMY still produces all its aluminum structures in their factory at Juprelle, located next to Liege in Belgium. 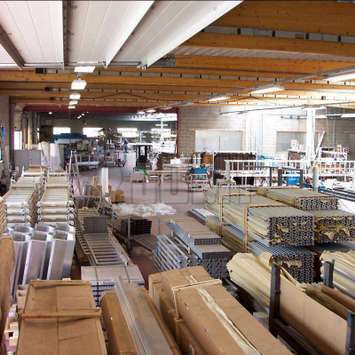 JOMY has three production plants of approximately 4400m2, next to the headquarters. One is destined to the production of stairs, the other to make ladders and the last one to create special constructions. The modular design of our range is our greatest asset. We combine our five product ranges to be able to better custom-built, save on costs, production time and lower the overall manufacturing risks. Our modular solutions are the results of a constant evolution, many great projects and a total experience of more than 50 years. JOMY is proud to carry out the production in Belgium of high-quality aluminum structures, at affordable prices. Since its creation by Gilbert Loix in 1968, JOMY has been growing continuously and is now present in over 50 countries. This is in part due to an increase in the export business, as well as to the local business in Belgium, Luxemburg and the Netherlands. Currently we are the Benelux market leader in our sector and the only Belgium company in our field of activity having an in-house engineering office and fully-equipped workshops. One of the advantages of our company is our specially-designed aluminium profiles. These allow us can get your installation ready asap. Today, we are happy to be able to share with you our expertise, solutions and references present in over 50 countries, all across the globe: USA, Mexico, Algeria, Spain, France, the Netherlands, UK, Columbia, Russia, Japan, etc. In Juprelle, we have 3 production plants for aluminium works and storage. In our offices, we have our own engineering department with 8 experienced engineers who will always find the best solutions for you. Overall, over 65 people work on the Juprelle site. Please feel free to provide any information you want to share at this stage. The more sepecific you can be, the better we will be able to respond to your request. At a minimum, we would like to be able to know the approximate location of your project, so the right people can deal with your request. Fields marked with * are required. All other fields are optional at this stage. Your request. Please include key dimensions and other informations you consider useful. You can add a file with more information. Please limit your filesize to 10MB max. errorYour file is too big. Please limit file size to 10 MB. errorSomething went wrong. We have not received your request. Please try submitting your request again, or contact us directly. Thank you for your request. We appreciate your interest in our products, and will get back to you shortly. You are not signed in. Sign in using your google account. You are logged in as: . Something went wrong. We have not received your request. Please try submitting your request again, or contact us directly.. You are not signed in.